Flight of the Conchords | Critical End! 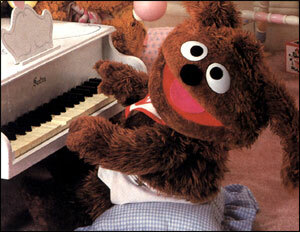 Sources cannot confirm an appearance by Baby Rowlf in the upcoming film. However, I can personally confirm that he is adorable. Just when I was beginning to get worried that we hadn’t heard anything about it for a while, The Cheapest Muppet Movie Ever Made! has landed a director. James Bobin, co-creator of The Flight of the Conchords, and writer/director of some of its best episodes, has officially signed on to shepherd the Muppets’ theatrical comeback. And he turned down a Judd Apatow movie to do it, which somehow makes me believe he’s got the right attitude to pull this off. I think a member of the Conchords brain-trust is just the choice for the Muppets. Both are smart, silly, a little off-kilter, and share a penchant for musical comedy. Plus Bobin’s a Brit, and the best Muppet stuff was produced in the U.K. And hey, maybe this means we’ll get a cameo by Albi the Racist Dragon! So we’ve got a funny British director, a script co-written by Muppet fan Jason Segel, and a cast of veteran puppeteers. If Disney can manage to not completely mishandle the marketing, this project may pump some much needed life back into the Muppets’ legacy.